The University is delighted to announce that Professor Keith Shine formally begins his new post as the University’s first Regius Professor of Meteorology and Climate Science today. The prestigious title of Regius Professorship was awarded to the University, and 11 other institutions, by HM The Queen earlier this year to mark her Diamond Jubilee. A Regius Professorship is a rare privilege. Before the recent awards, only two had been created in the past century. They reflect the exceptionally high quality of teaching and research at an institution. 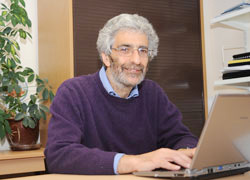 Professor Shine joined the University of Reading in 1988 and has been a professor since 1998. In 2009 he was made a Fellow of the Royal Society, the UK’s academy of science. Professor Shine was one of 17 Reading climate scientists who contributed to the United Nations’ Intergovernmental Panel on Climate Change (IPCC) Fifth Assessment Report published last week.